Finally, got the time to post a brief note on my newly acquired Maruti Swift Dzire Zxi Silky Silver. A longish post. Some Photos towards the end of the post. 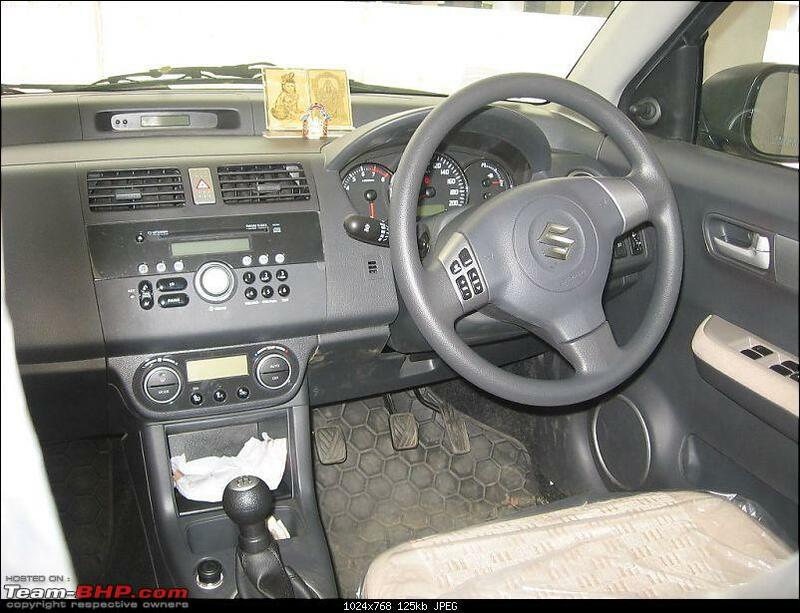 My previous vehicle was Tata Indica DLS (diesel), purchased Mar 2003, sold Dec 2007. Done about 36000 kms. Sold primarily because niggling issues were slowly turning into painful ones. Fairly satisfied with the overall experience, however kinda "promised" myself not to get another Tata vehicle in the future. 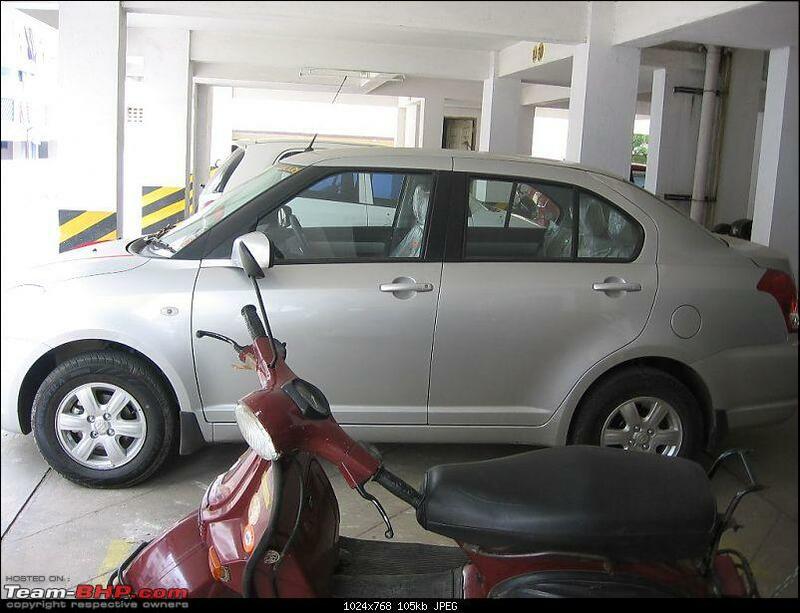 Competition to Dzire for my garage space, at various points of time from Dec 2007 were mainly the following - Sx4, Tata Safari, Tata Sumo Grande (inspite of the above "promise"). Had decided on a petrol vehicle - note my fuel analysis take here (Petrol Vs. Diesel (Swift Dzire)). 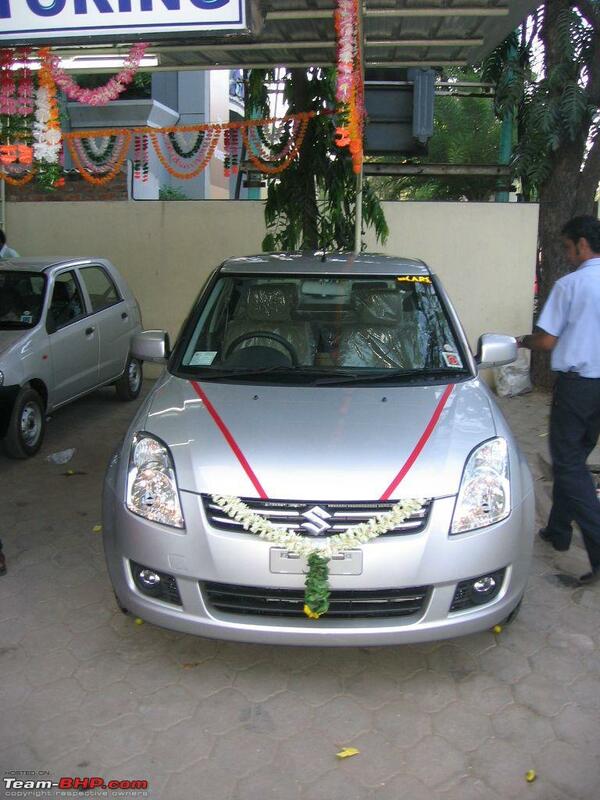 Got delivery of the vehicle on 24-Apr-2008 (about a week earlier). About a month in all is what it took to nail it down. Had a chance to pick up a Biege Zxi from one of the dealers in the very first few days, but slipped it up 'cos the color wasn't very appealing to me. Finally, decided on the Silver. Did take the Team BHP PDI checklist with me, but didn't make it a point to cross check it physically during the delivery, although I made it a point to mentally go thru' most of the things on the list. Total OTR (on the road) is about 6.25L (includes registration, life/road tax, insurance, number plates, basic accessories, 3&4th year extended warranty). No freebies from dealer (didn't try negotiating as well). 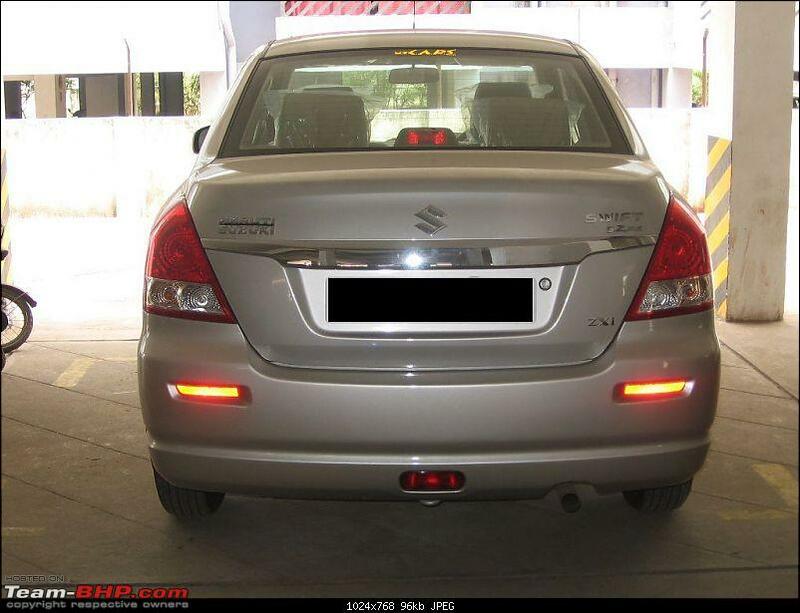 No corporate discount on Dzire yet. Basic accessories - floor mats, boot mat, mud flaps. Still missing - in my opinion (IMO) - sunfilm. Can live with the stock ICE (in car entertainment), although I wished it packed more thump and volume. The music controls in steering wheel are a pretty nifty feature ! The vehicle's done around 450kms in this one week time, most of it in the city and some of it in longish night drives on empty/almost empty roads. Don't know if I'm doing full justice to the recommended run-in period. Making it a point to stick to around 2K RPM max. Most of the riding during the day is in 3rd gear at around 30-40kmph. That hopefully qualifies me to write a small piece about this vehicle. * The outside temperature indicator (although I strongly believe it isn't working perfectly - as it showed 49 degrees celsius y'day anoon around 2pm in Chennai). * The lack of good leg space in rear (I'm 5'9". With driver seat adjusted for my position, there's still decent space in the rear. However, putting any luggage - like shopping bags, etc - cramps the available leg space extremely). * The lack of space in glove box. * The lack of space in the driver/co-driver door "magazine holders". * The fact that my hand (driver's) sometimes scrapes the leg of the front passenger while shifting gears (never happened in Indica) - maybe lesser width - will have to check out the specs. * Not yet been able to fix myself the best driving position - still getting a slightly sore back after "long drives". * The lack of good visibility via the rear view mirror due to the high boot. * The change over from diesel to petrol still inconveniencing me. 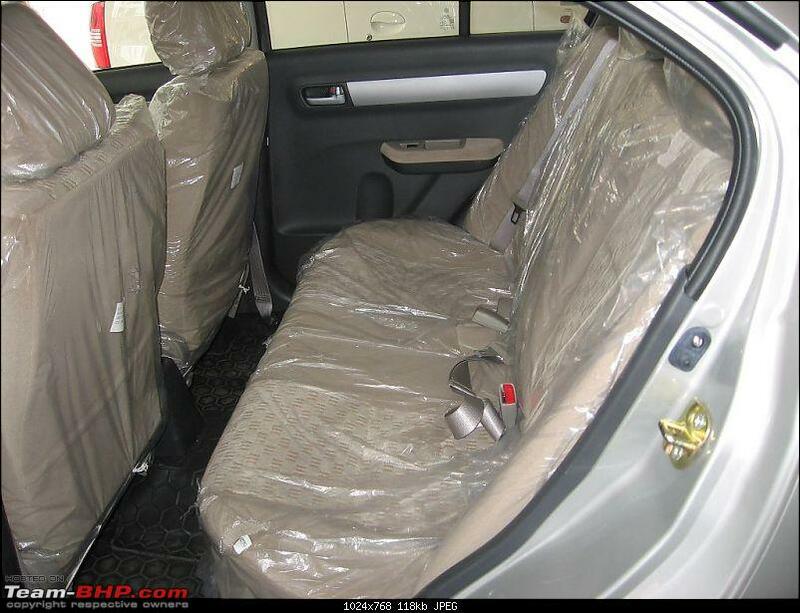 * The power windows don't operate when key is not turned on. They don't close automatically when vehicle is locked. (Autocop power windows and keyless-entry/anti-theft system on my earlier Indica had this nifty and useful feature). Looks like this is a "feature" of OEM fittings !!! * The volume and thump (bass) on the music system isn't exactly top notch. The Pioneer system on my older vehicle used to generations better than this and had tons of features as well. Overall it was a pleasant sale, nothing to really crib about. However, here are some interesting bloopers from the dealer sales/service. * I thought I'd seen a red color EPS (with those letters as such) sign on the display panel during delivery explanation. However, when I searched for it next day morning, couldn't find it on display. Read the manual and saw that it was supposed to switch on and stay on till ignition kicked in. This was the morning after I'd picked up the vehicle. Panicked a bit and called the sales guy first. I was amused and irritated when he gave me crap that it will be switched on only once first time of the day and not after that. Called up service and had an appointment fixed with them to check it out. A "specialist" showed to me that the EPS sign wasn't in actual letters (as I'd imagined) but had a different symbol. To allay my fears, he showed in another vehicle as well. * When I spoke to the service people for recommended driving speeds in various gears, I was given total crap. The guy just didn't have a clue. * NCB refund from my earlier vehicle was supposed to take 1 month. My dad who is an ex-insurance officer says it's an over-the-counter affair and should hardly take more than a few days if not minutes. One of the leaflets given with the vehicle recommends the following speeds for maximum FE. 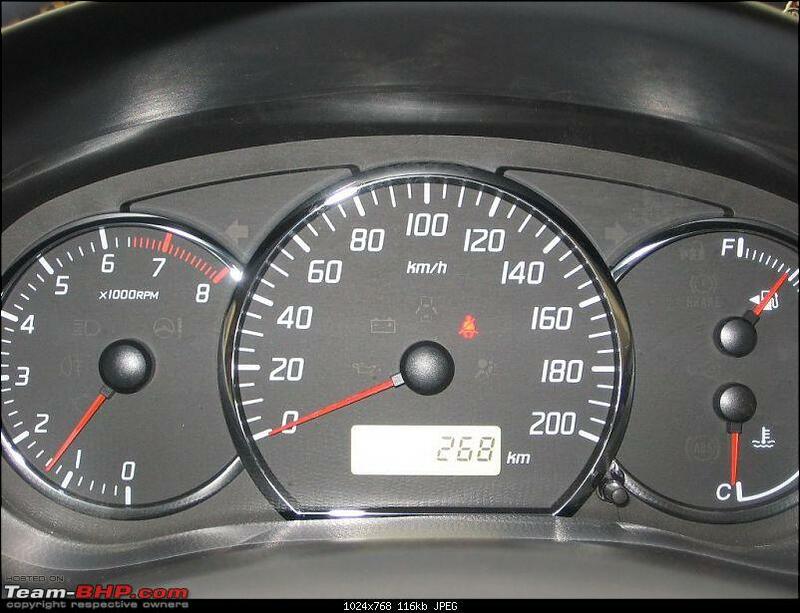 I'm however maintaining 3rd gear even while in the 30-40 kmph range (from my Indica days). Does one know if that is fine ? Any recommendations ? I had owned a Tata Indica DLS (diesel) for about 5 years earlier. The change over from diesel to petrol is still taking some time to get used to. Vehicle gets switched off once in a while, while in traffic, when I start inching forward from a stationary position. This stopping is however beginning to become lesser. Hope I'm able to overcome it completely in a short time. Any recommendations ? First full-tank-to-full-tank measurement yields 9.14 kmpl. This was at about 85% AC on. This post is an "almost duplicate" of the one posted in the Team BHP forum.